A lot of the Daily Challenge puzzles and Hard level puzzle packs contain games which require a more advanced knowledge of the Either Or clues. If you look at the puzzle example here, the second part of clue 3 tells us some information that might be hidden to the novice logic puzzler. From this clue, we know that Glasgow and buses are separate events but it also tells us more than this. If you look down the column on the grid you can see the player has already marked Glasgow and Buses as False . . . BUT . . if you carry on down that same column you can see that Glasgow also isn’t equal to Instagram or Cell Phones. So, looking at the first part of the clue we know that May 14th must be equal to Glasgow or Buses; and we now know that Glasgow isn’t equal to Instagram or Cell Phones and buses isn’t equal to Instagram or Cell Phones as they are in the same section . . it therefore follows that May 14th CANNOT be equal to Instagram or Cell Phones. From a previous clue May 14th and Instagram is already filled in as false but we can now fill in May 14th and Cell Phones as false. The same process now applies to 6000 (the other item in the first part of clue 3) which also CANNOT equal Instagram or Cell Phones so you can now fill these two boxes as false. The same process can also be used across the rows as well as the down columns. So where we see Buses and Glasgow is already false, we can also see that Buses are not equal to Birmingham either. So that then tells us that May 14th and 6000 CANNOT equal Birmingham either. Use this technique every time you see a clue beginning with “Of . . . .” and you’ll be able to solve some of the more difficult puzzles. Following on from our last playing tips post about Either Or clues, here we will go into another aspect of information that can be gained from these type of clues. 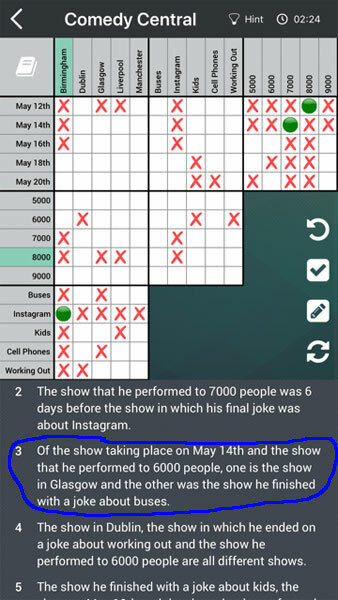 In this puzzle example clue 3 states “Of the show taking place on May 14th and the show that he performed to 6000 people . . .”. This tells you that the information in the second part of the clue (in this case Glasgow and buses) can only be equal to 6000 or 7000. As a result we can fill the following with an X as being false: Glasgow and 5000, Glasgow and 9000, buses and 5000, buses and 8000, buses and 9000. In the second part of this blog post we will explain another more complicated way of getting information from “Either Or” clues. A lot of logic puzzles contain either / or clues where one set of facts is contingent on another. 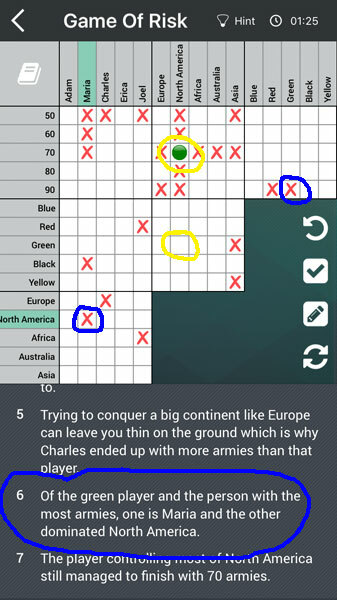 For example, if you look at clue six in the Game Of Risk puzzle pictured below you will see that it says “of the green player and the person with the most armies, one is Maria and the other dominated North America”. Now, there are a number of bits of information stored in clues like these. To start with, the “either or” clues are SEPARATE events. So we understand straightaway that the green player did NOT have the most armies, and Maria did NOT dominate the North America part of the board, so we can places Xs accordingly in these squares. 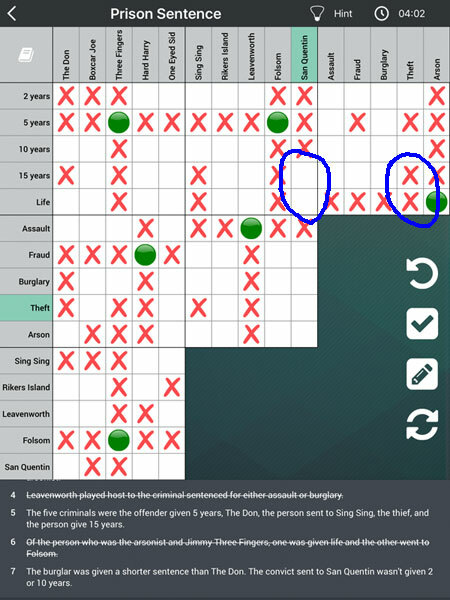 These have been circled in blue in the image below. Once you’ve done this, you can see if we are able to solve the riddle of this clue and unlock the true answers. It is telling us that the green player is EITHER Maria OR North America. From the clues we have so far we are none the wiser as to which of these statements is true. However, the clue is also telling us that the person with the most armies is also EITHER Maria OR North America. Now if we look at the grid we can see that North America actually had 70 armies (circled in yellow) and NOT the most, therefore North America cannot equal the most armies. If North America cannot equal the most armies then it must equal green and we can fill North America and Green as a true answer (circled in yellow). Now we know that it also follows that Maria had the most armies and we can fill that square in as a true answer as well. In summary – “Either Or” clues can give us a lot of information straightaway but sometimes their secrets have to be unlocked by filling in more of the grid so we can see which of the “Either Or” statements are true or false. We can see along the top line that Handel and Tenor are true. If we look down the left side of the grid we can also see that Tenor and 1st are true. This then leads us onto the realization that Handel and 1st must be true because the horizontal and vertical lines of true answers must intersect. If we now know that the vertical colum for 1st is Handel, Tenor, Drew – we then know that the horizontal row for Handel must have the same values . . so 1st, Drew, Tenor. Following the fact that the true answers must intersect, we then know we can fill in Tenor and Drew as a true answer as well . . loads of true answers filled in simply by intersecting the lines created by two truths. You can greatly speed up your solving of logic puzzles if you can “see” the patterns on the grid as they start to form. Everything in a logic grid has to slot together so if there are Xs for particular events horizontally then they will need to follow vertically as well. 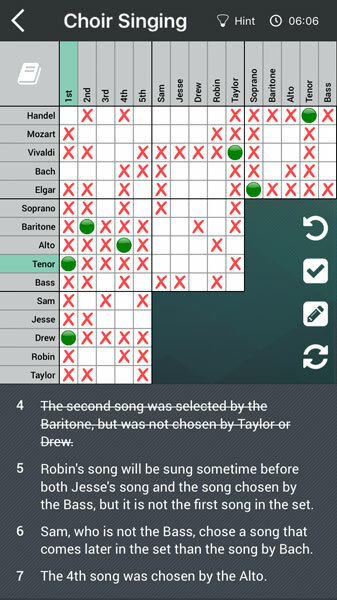 For example, in the image below we can see that Baritone and 2nd are true. If we look along the grid both horizontally and vertically, you can see various patterns that will match when there is a true answer linking them. 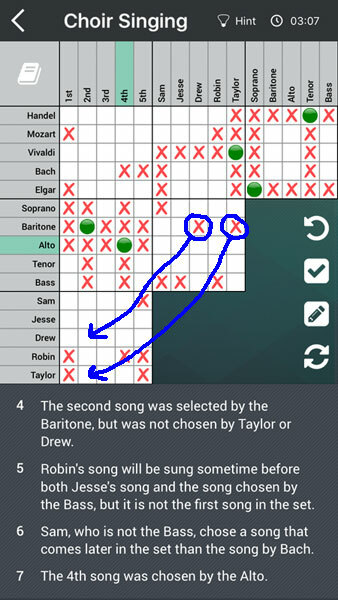 In this example, when we look to the right from the Baritone and 2nd true answer, we see that there are Xs showing that the Baritone was NOT Drew or Taylor. These Xs then need to be added to the grid at the bottom because, of course, if Baritone can’t be Drew or Taylor then it follows that 2nd can’t be Drew or Taylor either. Looking at this same example, there are several other cells that can be filled in by looking at the other true answers and seeing what information we know about them. For example, we can see that Alto and 4th are true. If we look down from this we can see that Robin was not 4th, so it naturally follows that we can put an X next to Alto and Robin. Similarly, we know that Vivaldi and Taylor are true, and looking along that line we can see that Vivaldi is not a Soprano or a Tenor, therefore it follows that Taylor can’t be a Soprano or Tenor either. After you have been solving logic puzzles for a while, you will be able to spot the patterns and the way they link together based on true answers.